I began Painting of Sorrow because I was interested in lost and destroyed paintings of WWII. Searching for paintings that could have been saved but were said not to be, brought me to the Flakturm Friedrichshain in Berlin, an anti-aircraft tower used to house a bomb shelter and a hospital as well as the paintings of the Kaiser Wilhelm Museum. More than four hundred paintings and three hundred sculptures were burned, stolen, or destroyed by bombs in the waning days of WWII. Did the Soviets loot the building before it burned? Or were some of the paintings stolen when the Soviet guards were inexplicably removed? One such painting was called variously Portrait of Fillide or Portrait of a Courtesan, a work by Caravaggio. Client Simon Wolf brings a copy of the painting to be conserved by the firm where Sarah Downing works. Is it a copy or an original? It’s Sarah job to conserve it but she wants to know the truth about the painting. Sarah is a painter as well as an art conservator. Her mind reacts to situations, landscapes, and people by seeing paintings in her memory that describe them. Throughout the book, images of paintings also reflect her emotional state and her fears. Early in the book, the director of the Art Gallery that is housed in the building where she works, frightens Sarah. Her mind brings up a picture of St. Jerome, an almost cadaveric man pictured in a desert, by Da Vinci. The taut skin of his face reveals the skull beneath. Sarah escapes a killer with her friend Peg. On the way, they stop at a lookout over Mazinaw Lake. 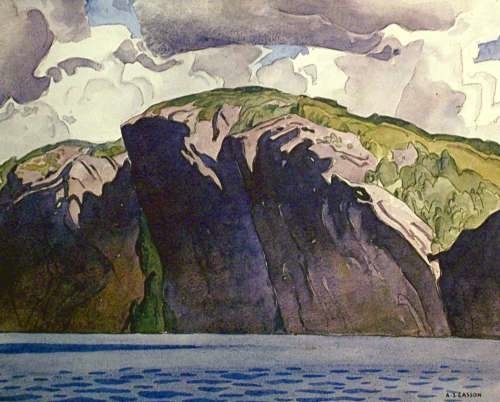 Casson painted the iconic Bon Echo Rock there. Later, approaching the security of a remote cabin in rural Ontario, she sees the building as a painting by A. Y. Jackson, Settler’s Home and somehow felt safer, for the moment. Her visions become darker and when she finds her new love Simon, beaten by her ex-husband, The Death of Marat by David, a nightmare of a painting intrudes on her thoughts. At the hospital, the controlled chaos of Emergency Room, by Fiona Rae reflects the roiling state of her emotions. I hope interested readers will search out the paintings mentioned in the book to gain a fuller understanding of Sarah and the events that changed her life. Online activity is second nature to today’s kids, but most of us with children didn’t grow up with the Internet. So it may be difficult to know how to advise them and monitor their safety online, especially when a lot of their school work and social life is centered on being connected. There is a lot that’s great about the Internet and the educational and recreational opportunities out there, but there’s also a lot that’s dark, evil, and dangerous. As parents, we need to help our kids make the right decisions and stay safe online. In his new book, Online Danger: Protecting Yourself and Your Loved Ones from the Evil Side of the Internet, cyber security expert, Dr. Eric Cole, devotes an entire chapter to the ways that parents can safeguard their kids’ online activities. Here are some of his top suggestions. Kids are not going to be as careful when it comes to downloading and installing apps that they want – particularly games. But just because an app (for phone or PC) came from the Google or Apple store doesn’t make it safe. Many of today’s apps – by default – ask for access to the device’s camera, microphone, and location services. This means that your child’s phone might be spying on him or her or making it easy to abduct them based on knowing their location. Review the apps on your kids’ phones, and together determine whether they still use the app and how the permissions are set. Children should have the expectation that you’ll follow them on social media platforms like Facebook, Instagram, and Pinterest. Make sure you all understand privacy settings, particularly who can see or share their posts and photos. You’ll want to check who has connected with your kids, and don’t be shy about asking about faces you may not recognize. You’d much rather hear, “oh that’s Joe from my karate class” than “oh, that’s just someone who asked me to be their online friend.” Remember that predators can be anyone they want online. Kids can’t be expected to always make smart decisions or foresee the consequences of their actions. That’s why, as parents, a big part of our job is to teach them these skills, encourage them to make the right decisions, and protect them – both from others and from themselves. Talking with your kids about online safety is an ongoing process that starts the minute they start swiping on your phone or tablet, and continues into young adulthood. Remember, monitoring your kids’ online activities isn’t “nosy” – it’s responsible parenting. In addition to the chapter devoted to protecting our kids online, Dr. Cole’s book provides advice for anyone wanting to protect themselves from scammers, hackers, and predators. You’ll learn how these online villains operate and how you can safeguard your credit, identity, and personal information. Visit www.onlinedanger.com for more useful tips, videos, and purchase information. Now available on Kindle. On October 11, 2017, That One Small Omission was published in e-book and print versions, and on December 12th, The Phone Call was published. The joy and excitement I feel each time I look at my mantle and see my first published novel is an emotion that I think only other authors can understand!